The best binoculars in the world are useless if you don't have them with you. What if you had a binocular so small and light that you always had it with you? You could always be ready and never miss a bird. Pocket binoculars get around any resistance to taking your binocular with you. They're so small that you don't even feel the weight, and they'll fit into a small pocket, such as a man's shirt pocket. Most pocket binoculars utilize the roof prism design, and have two hinges which allow the binocular to be folded very small when not in use. 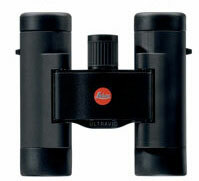 Those two hinges also mean that the binocular offers the closest possible minimum distance between the two eyepieces. A person whose eyes are close set may be able to use a two-hinged pocket binocular when other binoculars would not allow the person to see through both barrels at the same time. This same quality makes pocket binoculars usable by children, whose faces are not wide enough to fit a full-sized binocular. Pocket binoculars come in a range of prices, from very inexpensive, such as the Eagle Optics Energy, to the sublime pinnacle of quality such as you'll find in a pocket Swarovski or Leica. 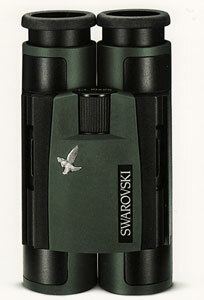 In general, pocket binoculars cost less than full-size binoculars from the same manufacturer. Some great bargains are to be had in the pocket binocular category. Does everything look smaller through a pocket binocular? No, pocket binoculars can magnify the bird just as much as full-sized models. And the image can be just as sharp and clear. There are some limitations. Their small objective lenses, usually only 20 to 25 millimeters in diameter, produce a smaller exit pupil than a full-sized, 42mm binocular. That can make it a bit harder to line up each eyepiece directly in front of the center of you eye. It might take a little practice to get used to the smaller exit pupil. For most people, in very dim light, like when it's almost dark, a pocket binocular cannot deliver as bright an image as can binoculars with 42mm objectives. But in ordinary daylight, assuming they have good optics and lens coatings, pocket binoculars will be just as bright as their larger cousins.